The hedgerows are dotted with the little red gems that are rose hips and they’re almost too pretty to pick, so why would you? For a start, rose hips are very rich in vitamin C, much more so than oranges. One 1940s study found between 200 and 1000 mg of vitamin C per 100 g of fruit pulp in samples of Rosa canina, the common British dog rose. Estimates for oranges are typically around 50 mg per 100 g of fruit, so rose hips have at least four times as much. The thing is, it’s a lot easier to eat 100 g of orange than 100 g of rose hips. Rose hips are rather small, but they have another feature that makes them difficult to eat. 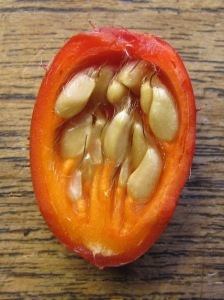 Each one consists of a thin fleshy layer (the fruit that you want) surrounding a centre full of seeds and tiny hairs. The hairs may not be obvious from looking at the fruit, but you’ll know about it if you touch them; they’ve been used for many a year by schoolboys (and one or two girls I could name) as itching powder. That’s right: The fine hairs that surround rose hip seeds are so irritating that just a few stuck in your clothes will have you itching for hours. I feel that eating them is probably best avoided. It is possible to remove the seeds and hairs from ripe rose hips, but it’s very fiddly. I have done this in the past and made fruit leather, which was nice, but a lot of work. Luckily, there is another way of extracting the goodness while avoiding the itching. Yes, it’s the classic rose hip syrup. Pick over your rose hips, removing bits of leaf and stalk. Rinse, if you like. Strain the juice from the mush. For this you will need a jelly bag or cloth that you can tie the pulp in, and something to hang it from. If you don’t happen to have a hook in your kitchen ceiling, a tall kitchen stool can be used, upturned or otherwise, depending on where the cross bars are (to hang the bag from). A bowl underneath would also be a good idea. If you squeeze the bag, the juice will be cloudier and you may risk getting some of those little hairs in it, depending on how fine your cloth is. On the other hand, you will get a lot more juice. It’s up to you – I squeeze. You may be wondering whether all that valuable vitamin C isn’t lost in the cooking process, as it’s well known that vitamin C is destroyed by heat. Well… actually, that’s one of those ‘facts’ that turns out to be a mistake – a much-repeated mistake. If you boil vegetables, it’s true that the vitamin C content after cooking will be much lower than it was in the raw veg, but the vitamin hasn’t been destroyed. It’s still there, in the water. Vitamin C isn’t destroyed by heat (as demonstrated by any number of high school science projects) but it is highly water soluble. This is great if you want to extract the vitamin from fruit pulp into water, as we do in this recipe. Now, finally, what’s the point? Making rose hip syrup is less work than extracting all the pips and hairs to make fruit leather, or some other fruit recipe, but it is still some work. Having got this syrup, what do you do with it? For several years, I didn’t bother making it because recipes tended to come with suggestions such as, “You can use this for all sorts of things – on ice cream, on pancakes – anything you’d usually use syrup for.” Always ice cream and pancakes. Now, I don’t eat ice cream or pancakes very often, and I don’t “usually” use syrup for anything very much, so I didn’t see the point of making it. It was only when I was making blackcurrant cordial that it struck me (I can be a bit slow sometimes): Cordial is syrup! This is a drink. I made some rosehip syrup, diluted with water, and discovered that, in spite of a suspicious resemblance to tomato ketchup (it’s not really that thick, it just looks it), it is delicious. There’s a hint of orange in the flavour – presumably because of all that vitamin C – but it has a taste all of its own. Note that I said, “Sugar to taste,” in the recipe. 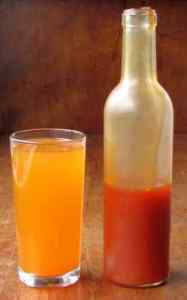 Now that you know you’re making a cordial, you have something to compare the taste with: Add sugar until it tastes as sweet as your favourite cordial/squash. Poured into a sterilised bottle, this will keep for a few weeks in the fridge. You can increase the shelf life by using heat to sterilise/pasturise further. If you heat both syrup and bottle close to boiling point (around 90°C) before filling, and leave very little air gap at the top of the bottle, this will keep for up to four months. If you use the deep water bath method of preserving, this can keep for up to a year. I think this might also make a nice, light sparkling wine, similar to elderflower champagne. If I can get more rose hips, I plan to give that a go. Any other suggestions for using rose hip syrup? 7 Comments on Rose hips: Why bother? Mucho happy to find this post sitting in my RSS Feed Reader today and a great reminder of why I leave dog roses in my garden. They might be possum fodder for most of the year but in about 6 months time they will give me back a wonderful vitamin C rich crop and this year, I will make syrup! Cheers from the backwaters of Tasmania for this lovely post. 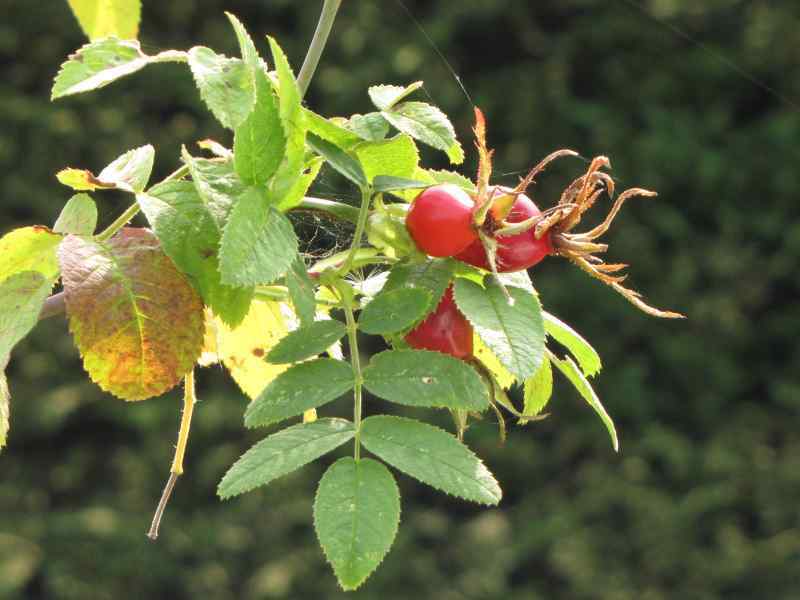 I understand that the nutritional benefit from rosehips is increased after the first frosts. Also, if gathering wild hips, please let us be mindful and leave at least half for the wild birds, as rosehips are one of their winter foods. Blessings Om shanti. Couple of years ago I made Rosehip syrup and used it as a cough syrup – really soothing. I’ve also dried whole ones for herbal tea and last year crushed a batch with elderflower to make rosehip and elderflower wine. No idea if it’s drinkable as it’s still ageing! Alternatively, dry them (you can even thread them and dry them in strings, which doubles as a decoration) and then use them in tea, by simply rehydrating and simmering them. Delicious with a spoonful of local honey! Hi, I regularily make rosehip cordial and have it over homemade yogurt. But like you I don’t have this every day so it often languished in the fridge. But I discovered that if you pop it in a pour and store bag when you make it you can freeze it and defrost as needed. I made rosehip wine 3 years ago and its still not drinkable so if you are going to do that be prepared to be patient. I’ve also made rosehip chutney in the past but it is so fiddly to make I vowed never again lol! Aegis Gears | Rose hips: Why bother? The ish Local - (Chat) • Re: Watch out! It's still hanging around.